Boil the potatoes in salted water for 3-5 minutes, drain and run cold water over the potatoes to stop them from cooking. Pat dry. For the garlic, use those little bitty cloves that are the center of the head of garlic. Don’t peel them. They just crisp up and sort of disappear. If you don’t have any little bitty guys, take an upeeled regular clove and slice into slivers. If like garlic, use more, if not, use less. You can figure this part out, I’m sure! Heat the olive for frying, not too hot, you don’t want the oil to smoke and scorch. 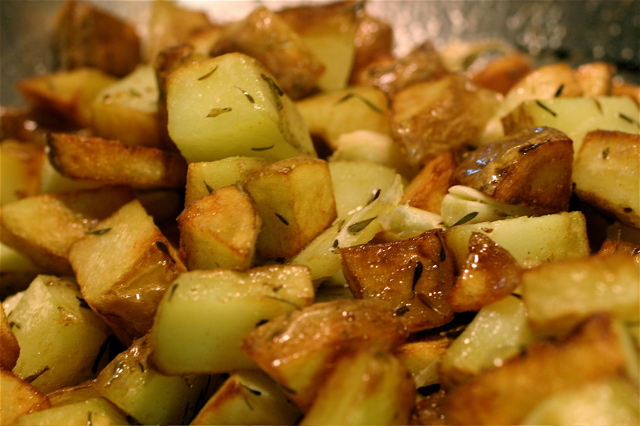 Add the potatoes and thyme and a little sprinkle of salt. Turn or toss frequently in the pan so everybody gets a chance to get golden and crunchy. About a minute before the potatoes are done, add the garlic and cook until everything is nice and golden. Finish with a little more salt, and serve immediately.